Proposed internet filter will turn platforms against users: Your action is needed! Policy makers want to make online platforms responsible for your content. 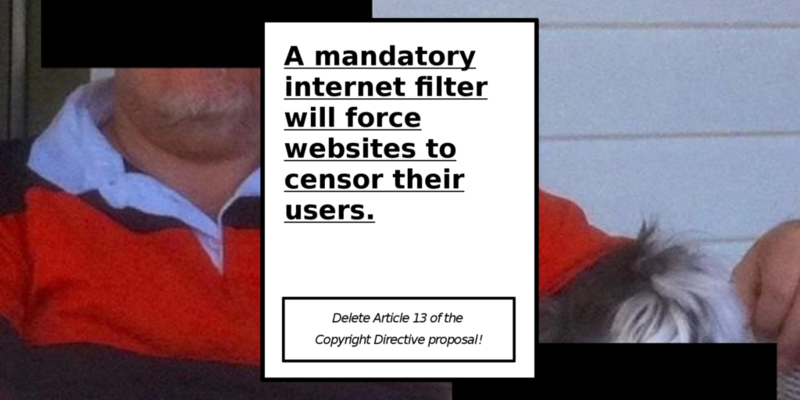 They’ll be forced to use automatic filters to screen the content you upload and decide what you’re allowed to post to the internet and what will be censored. To limit their risk, if there’s even the tiniest doubt about the legality of your contents, platforms will block your upload automatically if it is identified as a copyrighted material, regardless of your potential right to use it for, for example, parody or citation purposes. This will restrict your freedom of speech. Filtering is hard. When it comes to copyright, filters don’t recognise the “grey areas”: things like exceptions for educational purposes and parody. Filters don’t understand the difference between discussing racial slurs, and using them. However, if websites are forced to monitor all your uploads, they’ll also be held responsible when a filter fails and lets through content it shouldn’t have. It will no longer be a user in breech of copyright, but the platform in breech of copyright. take the risk to allow for parody, quotations, critique, and so on. The companies’ reaction to this new responsibility comes as no surprise: they’d rather block too much than open themselves up to the risk of blocking too little. Your right to express yourself will always be less important than a website’s business interests. We’ve written some tweets to inspire you, but feel free to compose your own!
. @MEP Stand up for our freedom of expression online. Please oppose the #censorshipmachine in the #copyright Directive proposal. We already tweeted at MEPs in their own language, check it out.